It feels like you are flying on the ground. Something that would catch the eye of even Superman, riding on a Shinkansen bullet train is one of the coolest experiences you can have while traveling in Japan. Having pre-purchased a rail-pass ( highly recommended if you are planning a trip to Japan, click here for the company we used ) we were able to hop on and off at will to travel across the country. In total we took 10 Shinkansen trains traveling across roughly 2,600 kilometers (1,600 miles) during our 23 days in Japan. It wasn't until that moment, standing at Himeji station, that I realized the incredible force of the modern engineering feat. I remember standing alone near one of the tracks as a Shinkansen train flew by at what must have been 200 km/hr. I found myself frozen and nearly frightened - what the heck was that? There is no warning signal and because it travels so efficiently fast - no real sound it makes as it nears. As another train passed I realized that the only warning signal is the rumbling of the ground beneath you about a second or two before the train passes. Within a few seconds it's here and gone. Although nowhere near a dangerous experience, it opened my eyes to the power of the Shinkansen - and boy, are the Japanese proud of their cool toy. While traveling to Hokkaido we took one of the newest trains which carried us from Okayama to Hakodate (basically from south to north island). Traveling at roughly 300 km/hr the trip carried us across climates into the mountains. Once in Hakodate, we witnessed advertisements, banners, bento boxes, and even sake bottles featuring Shinkansen marketing material. First Shinkansen line: Tōkaidō Shinkansen in 1964, connecting Tokyo and Osaka. Carrying 151 million passengers per year and at over 5 billion total passengers it has transported more passengers than any other high-speed line in the world. Maximum speeds of 240–320 km/h (150–200 mph). Test runs have reached 443 km/h (275 mph) for conventional rail in 1996, and up to a world record 603 km/h (375 mph) for maglev trains in April 2015. The network presently links most major cities on the islands of Honshu and Kyushu, and Hakodate on northern island of Hokkaido, with an extension to Sapporo under construction and scheduled to commence in March 2031. It's a fun experience too, riding on the actual train. It's one of the few areas in Japan where public eating and drinking are acceptable and they even have a food and beverage cart on the train. Our preference however, was to grab a tasty bento box at the train station prior to boarding. 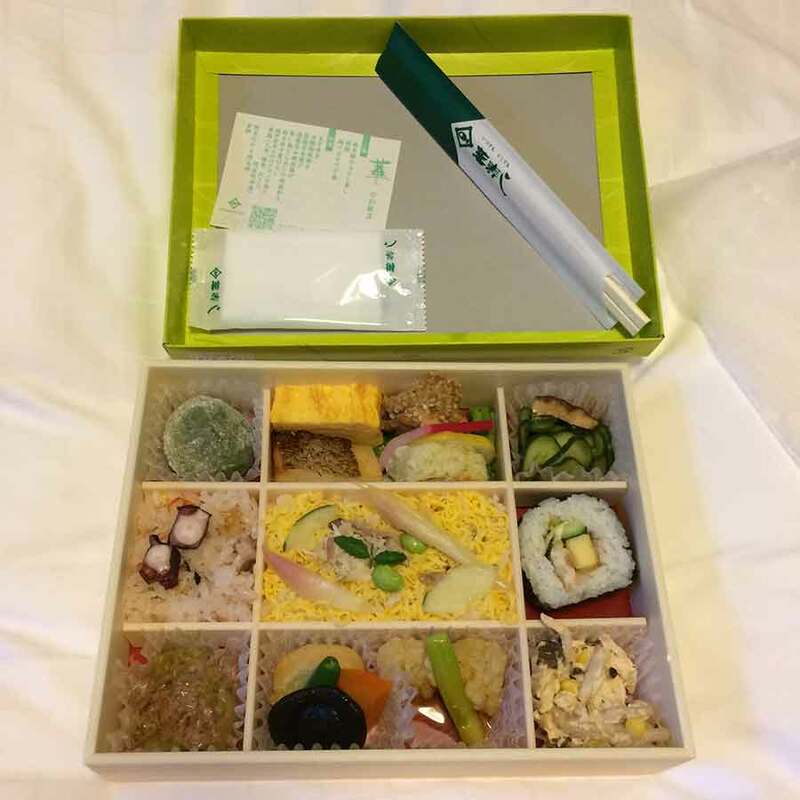 If you are planning to make a trip to Japan in the near future, be sure to grab a rail pass and treat yourself to a bento box and beer on one of the fastest trains in the world.